What would you do if you were a Christian musician who didn't feel that it was your time to be out playing, but you had all these synthesizers, sampling keyboards, drum machines, and recording equipment in your basement? And what if your favorite music was a type of music that no other Christian band was playing and you had a real vision to make music that satisfied Christians with tastes like your own yet reached another whole segment of mainstream music fans with the gospel? Well, if you were Roger Rose, you might create Mad at the World, write all the songs, play all the instruments, and produce an album of the same name. That's exactly what he did, and his album was recently released on Frontline Records. "I personally know plenty of people -- Christians -- who listen primarily to mainstream music because Christian music does not satisfy them musically," says Rose. "What Mad at the World is about is music that fills that kind of void, yet I feel it is lyrically uncompromising in its Christian message and values." Although astute listeners can detect the influences of Ultravox and Tears for Fears on the music of MATW, clearly Rose is most affected by the sounds and philosophy of Depeche Mode. While the group's music has deeply impacted Rose's, he is often repelled by songs like "Blasphemous Rumours" and albums like Black Celebration. Rose explains, "Depeche Mode is probably my favorite group musically, but lyrically they are the most offensive, so dark and terribly depressing." Rose responds to these discrepancies by writing directly to the untruths which might be affecting youthful listeners. In the song "Dry Your Tears," for instance, Rose describes "a world where you see nothing everywhere" (an expression of the nihilism found in many a Depeche Mode lyric) before expressing his own hope with "Close your eyes and pray/ Heaven could be calling your name." "I write things lyrically," affirms Rose, "that are undeniably Christian but seem to be easy concepts to accept or grasp from a secular standpoint. Although I work at subtlety, it's also just another way of expressing the truth that if you love your possessions or your girlfriend or anything on this earth more than God, then the result is death. That is an important message for Christians to bear in mind as well as something to be shared with unbelievers." Rose's attempts to avoid church talk and cliche result in some fresh, invigorating images. In "Living Dead," the line "I need life blood" is, Rose suggests, "another way of getting at Jesus' words that we need to be born again" without using those now too familiar words. "Taking the Easy Way Out" actually suggests that it is the voice of the Evil One that offers suicide as a way of ending the pain of life when it really "isn't the easy way out." Like Depeche Mode and other bands of the techno-pop world, Mad at the World will be out on the road this year without a drummer. 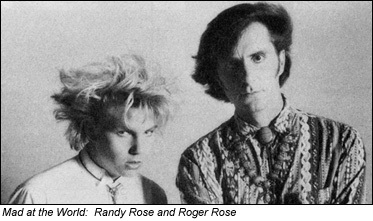 Like the aforementioned band, essential kick and snare sounds will be programmed into the computer while Rose, backed by 15-year-old brother Randy Rose playing percussion and sampled sounds and Mike Pendleton on various keyboards, will sing, play guitars, and add occasional synths. Rose is excited about the new record, its impressive cover art by Frontline's Ed McTaggart, and talk at the label about marketing to college radio and reaching mainstream listeners. Right now, though, he's thinking more about touring and work on the next record. After all, Roger Rose is not just upset -- he's Mad at the World. Copyright © 1987 CCM Publications, Inc.